Last week I had a call with Patrick Carey and Jason Leiblich from Exoprise to talk about monitoring cloud applications, which is something that is slightly off my typical radar. Patrick and Jason are both ex-Citrix, and each ended up there via an acquisition (Patrick is originally from Ardence and Jason was originally from Reflectent). Last week I had a call with Patrick Carey and Jason Leiblich from Exoprise to talk about monitoring cloud applications, which is something that is slightly off my typical radar. Patrick and Jason are both ex-Citrix, and each ended up there via an acquisition (Patrick is originally from Ardence and Jason was originally from Reflectent). At first I was hesitant, because there are so many monitoring solutions out there that seem to do the same thing, but the cloud app aspect of it drew my interest. What Exoprise has put together is a solution called CloudReady that observes the performance of Office 365 applications to identify problem areas in the path between your users and Azure, which they call the blind spot. We typically know what's happening in our data centers, and Office 365 provides very basic status information at http://status.office365.com, and more in-depth information within your account control panel. Those can be somewhat helpful, but Exoprise's solution looks at the bits between you and the cloud to discover potential problems and help you point the finger at the appropriate people, be they your ISP, someone else in the middle, or Microsoft themselves. CloudReady works in a few ways. One is by using agents deployed at different machines around your organization. Using multiple agents avoids false alarms from a single wonky machine, and, in the case of remote locations, also gives you some insight into which paths or Azure data centers are having problems. It can identify bottlenecks or misconfigurations with ADFS at Exchange Online, or even help determine whether or not Microsoft is meeting the uptime specified in your SLA. The other way CloudReady works, which I think is really, really cool, is that they can use aggregated, anonymized information from all their customers to identify common problems affecting all users of Office 365. Think of it as a programmatic, streamlined version of the typical "Is Hulu down for everyone or is it just me?" tweets. As with anything crowdsourced, the more people involved with this method, the more accurate it gets. CloudReady can see the path each customer takes to get to Office 365 and identify the weak links in the chain…like a TDR for cloud applications. The admin interface to CloudReady is in the cloud, with the local agents acting as data collectors. 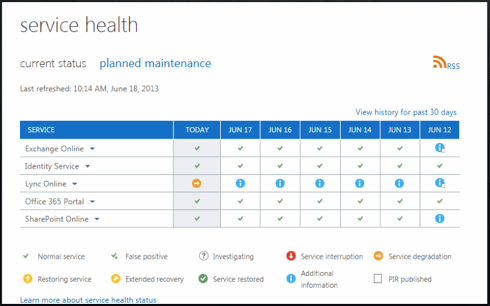 That data is then processed by the CloudReady service and is available to you through their site at a much more granular level of detail that you can get from the Office 365 status pages. This is kind of cool, right? I hadn't put much thought into monitoring cloud services with something other than what was being provided to me from the services themselves, but holding them accountable while monitoring the path in between the users and the applications seems like something that could help organizations come to terms with letting someone else host their apps. There are two challenges that I think should be addressed in the near-term for a solution like this, though. It's easy enough to understand why a company would align with Microsoft to release a solution. Microsoft will provide the access and support, and they have a number of services that can be monitored. The problem is that, when it comes to the cloud, Microsoft is just as new as everyone else. Sure, they'll have an easier time getting people to convert from Office to Office 365 than Google will converting people from Office to Google Drive, but with the cloud application environment growing as fast as it is, Exoprise and companies like them will have to focus on other applications from other providers sooner rather than later. I'm certain that other companies do something similar, and that they will email me to tell me about their solution after reading this. I'm also certain, though, that there isn't one product that monitors all cloud apps. As this sort of thing becomes more important, can you imagine having one monitoring platform for each app? Yikes! Exoprise told me that their long term vision is to expand this beyond Office 365, and that this concept could work on other SaaS or PaaS solutions as well. Here's hoping for something sooner than later. I'm not sure if anything exists that addresses this need today, but part of the allure of cloud apps is that it allows our users to have more ubiquitous access. The CloudReady solution, which uses agents deployed to PCs, doesn't seem poised to help in this environment, other than to redirect access to Office 365 apps through the corporate VPN. If we're talking VPN-less connections from unmanaged devices or ones not capable of running the agent, though, there's still a hole in what we can monitor. Perhaps VPN-based solutions is as good as we can get today, or perhaps as solutions like this come to market, there can be bits of intelligence built into the apps themselves that leverage a monitoring solution. After all, monitoring is good for the providers as well. If a customer with a problem calls to blame the provider, they can turn around and point the finger back at the customer since they'd both have access to the same information. I believe Evernote are using a product called ThousandEyes to assist in full route performance/availability troubleshooting. If you simply need third party availability stats CloudHarmony offer a public status page. I agree that as more workloads migrate out of the enterprise its important to maintain active availability and performance stats... esp if the SLA have any teeth.